California's Prisons Will Change Solitary Confinement Rules : The Two-Way The state agrees to stop placing inmates in solitary confinement solely because of a gang affiliation. The changes could move more than 1,500 inmates out of solitary. California has agreed to revise its rules on solitary confinement. 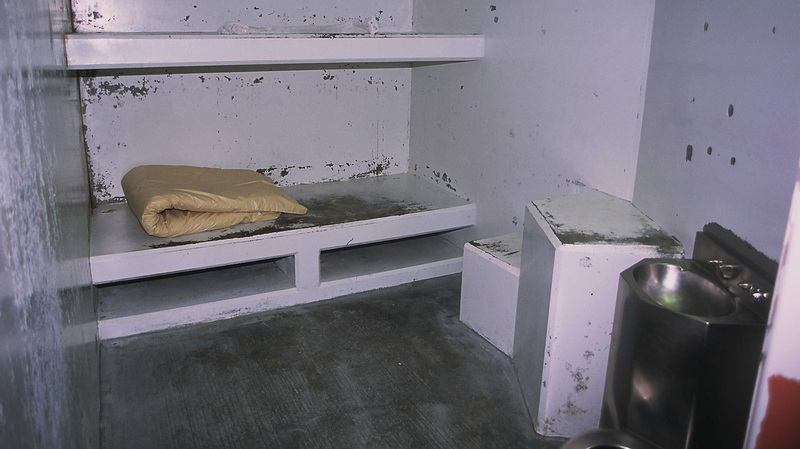 This file photo shows a cell in the Secure Housing Unit of Pelican Bay State Prison in Crescent City, California. In a resolution that could have wide effects, California's prison system has agreed to change how it handles solitary confinement — and to review the cases of nearly 3,000 prisoners who are currently in solitary. The changes are part of the terms of a newly settled class-action lawsuit. As part of the settlement, the state is agreeing to a central demand of the plaintiffs: to stop placing inmates in solitary confinement solely because of a gang affiliation. "Lawyers for the prisoners say more than 1,500 people could be moved out of solitary," NPR's Carrie Johnson reports. "Prisoners held in long-term solitary confinement filed the class action lawsuit three years ago. "Hundreds of inmates said they had been held in isolation for 5 or 10 years or more, with no chance to challenge their prison conditions. They argued that treatment violates the Constitution's ban on cruel and unusual punishment. "Prison officials say they will create a new high security unit for serious rule breakers, but even those inmates will have some interaction with others. "A union that represents corrections officers objects to the settlement and says it could increase violence behind bars." Advocates for prison reform say the changes could become part of a template for other states. California has one of the country's oldest and largest isolation units in the country, at Pelican Bay State Prison in the state's north. In 2013, the prison was the origin point for a hunger strike that was believed to have been orchestrated by the leaders of four rival gangs. One of the men had been in solitary for more than 20 years. Back in 2006, NPR's Laura Sullivan visited Pelican Bay as part of a larger series, "Life in Solitary Confinement." A prisoner nicknamed Wino, who was in his 40s, told Laura through his cell door that he had been placed in isolation for being involved with prison gangs.
" 'The only contact that you have with individuals is what they call a pinky shake,' he says, sticking his pinky through one of the little holes in the door. "That's the only personal contact Wino has had in six years."